Fonseca Porto produces the 2007 Fonseca Vintage ($228.30), a fortified wine from Port that is made of tinta roriz of 2007. Uvinum users evaluate this fortified wine with 4 out of 5 points and in guides it has been reviewed: robert parker: 96 and wine spectator: 94. Do you know where the famous port wine Fonseca Vintage 2007 is produced? In the Upper Douro Valley, one of the most beautiful wine-growing regions in the world. The character of the port wine comes from a combination of soil, grape variety and climate. The vines are planted in stony slate soils, which give the wine a very special taste, on steep slopes overlooking the river Douro. The best way to enjoy the Fonseca Vintage 2007 to desserts! You're gonna love this port. - Nose: Fragrant aromas of rose and dried fruits, almonds and walnuts. - Mouth: The palate is rich and delicious, with thick velvety tannins and well integrated beautifully wrapped in a succulent fruit jam and rich flavors of black chocolate. 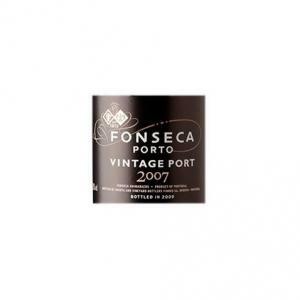 If you want to buy 2007 Fonseca Vintage, at Uvinum you will find the best prices for Port fortified wine. Purchase it at Uvinum at the best price, easy and 100% safe. We have more than 59.000 products for sale in our catalog becoming this way the biggest online shop to sell wine, beer, and spirits in Europe with more than 38.000 customers trusting us.